This anemone was inside a coral tower, about 25 metres down. There was a kind of niche two thirds of the way up where the life was just incredible. 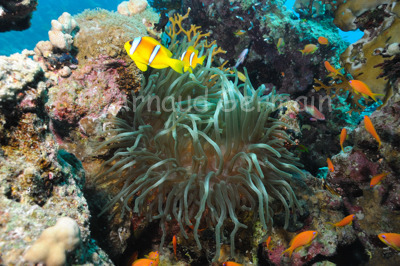 There were anthias, glassfish in a corner and a lionfish as well as the anemone and the clown fish. I used the widest setting of my zoom to take the picture. Good buoyancy is also crucial to take pictures in a responsible way, without damaging the coral. Nikon D700, Nikon 28-105 mm macro at 28mm, F8, 1/60th, ISO 400, Ikelite Housing and Ikelite DS160 strobe set on TTL. Ras Katy, about 25 metres down, Sharm El Sheikh, Egypt.